streamlines these forms as fluctuations in a given environment are met by moves and countermoves. Genetic expression comes through ones environment and to not adapt to feedback loops is a great recipe for failure. It has been said that specialization equals extinction from a biological anthropological perspective and in light of our specialized, material based world the time to adapt and remember the brilliance in pattern understanding and application is now revealing its paramount importance. The principles of permaculture present time and space patterns vastly important for our design work and the ubiquitous patterns of the universe give a creative spark. This recognition comes from a fined tuned sense; a sense that must be honed by humans for a successful evolution. It is without doubt time to break from the strictly material world focus (matter) and gain balance, the yin and yang with patterns and all that follows from these successful forms and their guidance. A simply analogy is erosion or leaks of energy. If a boat has a leak it sinks, if our society is always leaking energy, it will fail. To reverse this is to make sure that the boat never gets a hole in it rather than trying to bandaid it. 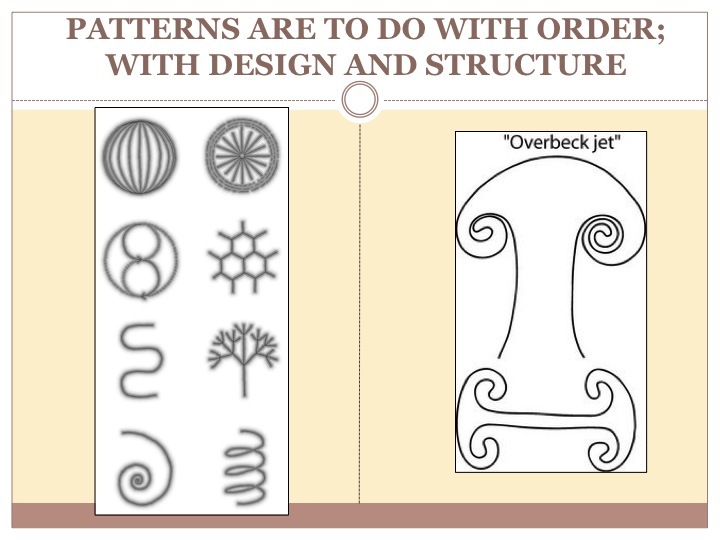 In the patterns chapter of this online resource I will go over some of the patterns that are available to learn from as designers and begin to use them. At first patterns can be very abstract and some choose not to ground this application, however I will try and seek balance between seeing the forms in nature and seeing how they have been applied along the way in my travels and research. With the pictures below can you see only physicality (matter) or can you imagine the flows of energy that occur within them as the masters once did? I have been inspired by both Bill Mollison and Victor Schauberger for their work on patterns and the pages that follow will show this. Both were masters, along with others like Da Vinci, at seeing these moments in time and freezing them into a solid state for comprehension. Remembrance that form and existence are interlnked with structure brings a simple understanding. No matter the pattern, no matter the crossover between them, it’s not so much the physicality of it all, rather the energetic exchange that is facilitated that frames how we utilize this understanding for our design work. Much of what organic farming is about is moving organic material around from one spot to another. So how can the pattern of lightning help with this? Well maybe our paths on a farm should reflect the dendritic pattern as to facilitate the dispersal of materials and energy just as it does in so many places- rivers, circulatory systems, tree branching, and on. Read more and enjoy.